New generations of high-speed data converters address the need for growing bandwidths and data rates and put increasing demands on clock speed and digital processing power. On the other hand, aspects such as low power consumption and heat dissipation present additional challenges during the development and verification of electronic and RF designs. Today’s digital designs and data converters with high rates require clean clocks with minimal jitter. Modern digital designs and data converters can only work as well as the applied clock source allows. See how to get the best performance by using a state-of-the-art clock source. 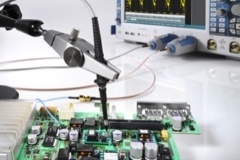 Combining a low-noise oscilloscope with a power rail probe, developed uniquely for measuring power rails, provides a measurement system that delivers measurements that are more accurate. When analyzing the robustness of data transmission systems, jitter is a key indicator. It is recommended to use jitter measurement instruments for both the time and frequency domain in order to differentiate between fast and slow moving artifacts. A new phase noise test instrument covers the frequency range from 1 MHz to 50 GHz with direct down-conversion analog I/Q mixers and baseband signal sampling. The traditional PLL has been replaced by a digital FM demodulator for phase detection and frequency tracking. 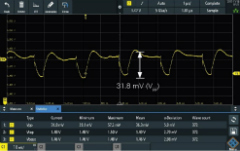 An additional AM demodulator enables concurrent measurement of phase and amplitude noise. High-speed serial interfaces often transmit data with differential signaling. For probing on the signal, trace differential probes are used. 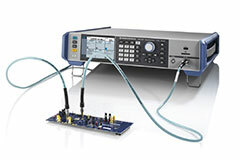 Besides the differential inputs, these probes often provide an additional connection for ground – especially the higher bandwidth models. The ground connection on the R&S®RT‑ZMxx modular multimode probes can be used to improve measurements on high-speed differential interfaces.